Explanation: Aloha and welcome to a breathtaking skyscape. 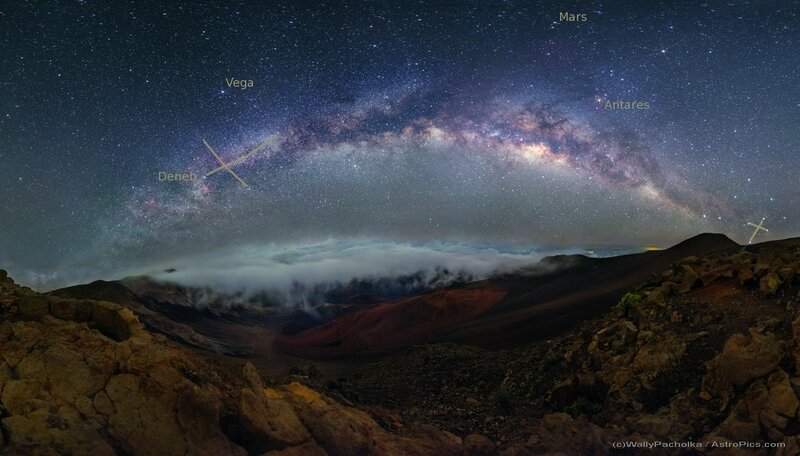 The dreamlike panoramic view from March 27 looks out over the 10,000 foot summit of Haleakala on Maui, Hawai'i. A cloud layer seeps over the volcanic caldera's edge with the Milky Way and starry night sky above. Head of the Northern Cross asterism, supergiant star Deneb lurks within the Milky Way's dust clouds and nebulae at the left. From there you can follow the arc of the Milky Way all the way to the stars of the more compact Southern Cross, just above the horizon at the far right. A yellowish Mars is right of centre, near the top of the frame, with rival red giant Antares below it, closer to the Milky Way's central bulge. Need some help identifying the stars? Just slide your cursor over the picture, or download this labeled panorama.